Most of you know that I don't really like McDonald's. Don't get me wrong. I don't hate junk food. I love them. I love them so much that I felt McDonald's isn't good enough to grace my atas palate. Before I go on, let me pause to pose a question. It's McDonalds or McDonald's? It's MacDonalds or McDonalds? How many people know this without needing to check? I have to admit I didn't know what was the right answer prior to googling about it. It's McDonald's. Ok. Got it. 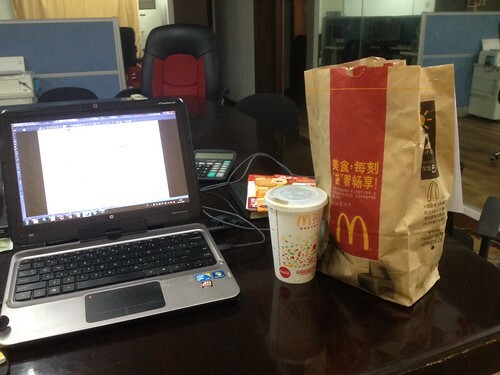 Coming back, the reason there is Macs on my table was because I got lazy to go out to find food at the end of everyday. When you are on foot, you tend to be restricted by how far your feet are willing to get you. Don't forget to factor in the distance of the walk back too. Also, it's a matter of time before you exhaust every available outlet in your proximity. Normally, I would have been glad to get out there to jalan jalan but it's the peak hour then where you have traffic jam as well as human jam. Then, there is also the relentless summer heat that you just want to hibernate inside the air-conditioned office. Hence, a click here and a click there of the mouse and voila! Mac on ya Deck! Arrenn: I needed 3 monitors back then was when I was handling procurement and I needed to view several spreadsheets concurrently (past sales performance, current stock inventory, sales forecast etc). My new scope of work in the Capital doesn't need all these anymore. Besides, I am very mobile i.e. have to travel at a moment's notice that I gave up the office room and am now operating from the conference room table. The "rootless" type of lifestyle really takes a lot to adapt. Hey u shld walk ard the neighborhood. Most food places provide delivery if ur place is nearby. Got a lot of food without getting fast food this way. @starmist: of MickeyDee if you want to add to the list. Anonymous: I have been doing that and collecting their delivery menus.